Before you begin the process of composing, three examples are offered to play and study. Notice the various ways in which composers have integrated the player/client within the musical whole, and the range of styles, moods, tonality and instrumentation possible. 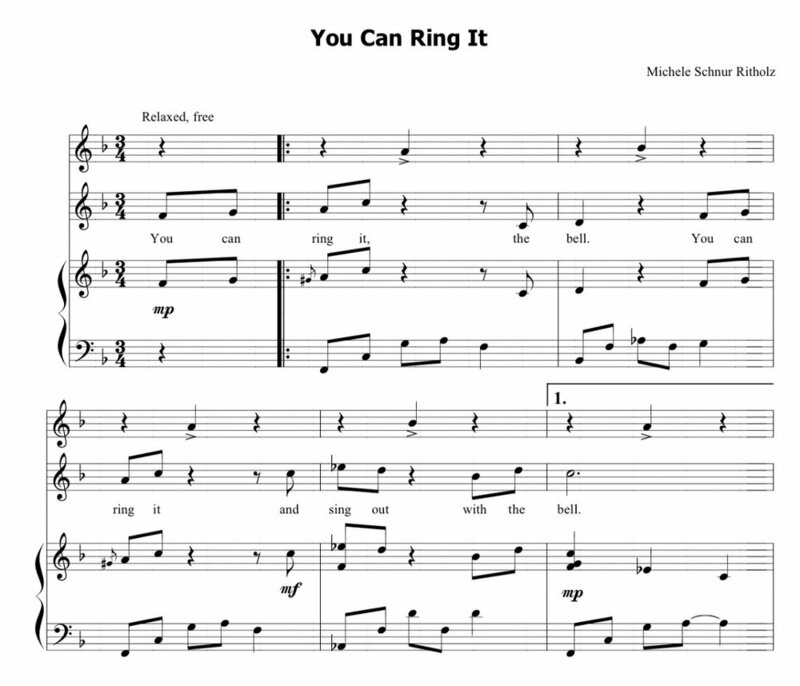 The following excerpt of the B section of “Jazz Bells” written by Marc Houde, was composed for children ages 5-8. (Composition and Improvisation Resources for Music Therapists, 2015, Barcelona) While the melody of the bell (notated in the upper treble clef) is clearly in F major, Houde writes in a jazz idiom, adding unexpected chords and tones in the piano accompaniment. Each bell pitch fits well with the quickly changing chords underneath. This section promotes a slow, controlled and lyrical melodic experience for a client, while the rich harmony also serves to focus the player’s attention and emotional involvement. In “Principles of Clinical Composition I, ” we looked at several pieces that called for a single response in the rest after a well-defined phrase. Here is another (unpublished) example of that compositional strategy. While at times there are notes for the piano to play as the bells are played, they are to be played dynamically “underneath” the bell sound. The ¾ meter, changes in dynamics and use of lyrics that encourage participation all contribute to the experience for a single player, or two players taking turns. The last example illustrates 2 brief sections of a Nordoff & Robbins’ arrangement of the traditional spiritual found in Music Therapy in Special Education (Second Edition, 1971, Barcelona). The song is scored for 5 players, using 3 pitched reed horns, a large cymbal and a sonorous drum. Instruments are chosen for their contrasting timbre which enhance the dramatic expression of the song. Group members are encouraged to sing the lyrics, and the complete musical/clinical process, facilitated by a therapist, demands their attention and cooperation. The following final measures offer the horn players an opportunity for turn-taking in a rapid exchange of notes. At other points in the piece, they blow loudly together, creating a real sense of camaraderie and strength. The style in which the pieces above are notated, with separate staves for 1) the solo instrument, 2) melody/lyrics and 3) treble & bass accompaniment, is the model you will use for notating your composition.